With a backdrop of Chicago, IL, Lasallians navigated an eye-opening experience on violence, social justice, community suffering, and peacemaking through the Lasallian Social Justice Institute (LSJI). 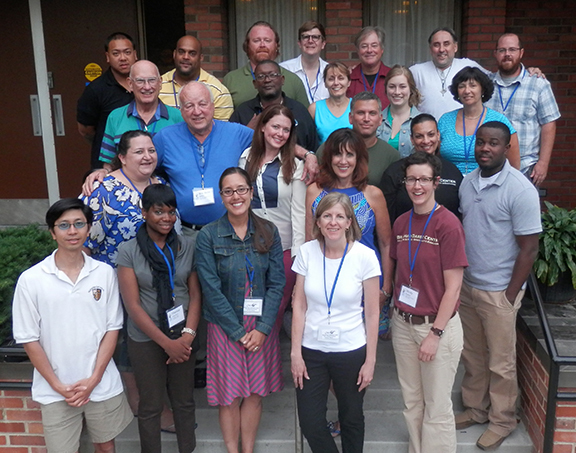 The program, which is offered by the Office of Lasallian Education, was held July 21 – 26, 2013, at the Cenacle Retreat and Conference Center with a theme of Violence and Peacemaking in an Urban Environment. LSJI is based on the Gospel and our Lasallian vocation to seek social justice and serve the poor. It is designed to be experiential, educational, creatively practical, and reflective. This year, the Br. David Darst Center in Chicago led the organization and planning of the program for 21 participants. Highlights included looking at violence as a symptom of various social issues, hearing from representatives who minister to young people about violence prevention, and visiting local ministries that address all aspects of violence. What they learned at LSJI doesn’t end there. Participants are taking their experiences back to their ministries in order to impact others. “Since social justice is an important part of my teaching (law courses and Lasallian honors), my deepened understanding of social justice in the context of lost opportunity, labeling, and racism will enhance my ability to let our students at St. Mary’s University in Winona see the bigger picture,” said Price. In previous years, LSJI has focused on immigration in Tucson, AZ, and El Paso, TX; homelessness in San Francisco, CA; and civil rights in Memphis, TN. With each gathering, LSJI aims to help participants draw closer to the world of the poor in order to be evangelized by them.